The nature of wildfires is changing – in the US, they eat through twice as many acres per year as they did 40 years ago. 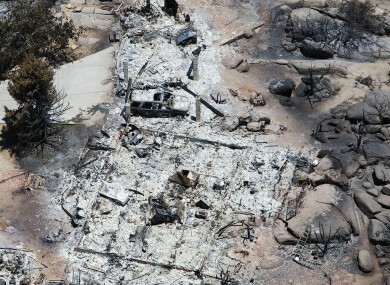 The aftermath of the Arizona fire in which 19 firefighters lost their lives. THERE’S A DANGEROUS but basic equation behind the killer Yarnell Hill wildfire – in which 19 firefighters were killed in the US last weekend – and other blazes raging across the west of the States this summer. More heat, more drought, more fuel and more people in the way are adding up to increasingly ferocious fires. Scientists say a hotter planet will only increase the risk. More than two dozen wildland fires are burning from Alaska to New Mexico, fueled by triple-digit temperatures and arid conditions. In the Arizona mountain town of Yarnell, a blaze apparently sparked by lightning killed 19 members of an elite firefighting squad who had deployed their emergency shelters Sunday when erratic monsoon winds sent flames racing in their direction. While no single wildfire can be pinned solely on climate change, researchers say there are signs that fires are becoming bigger and more common in an increasingly hot and bone-dry West. Wildfires are chewing through twice as many acres per year on average in the United States compared with 40 years ago, U.S. Forest Service Chief Tom Tidwell told a Senate hearing last month. Since Jan. 1, 2000, about 145,000 square miles have burned, roughly the size of New York, New England, New Jersey, Delaware and Maryland combined, according to federal records. A draft federal report released earlier this year said climate change is stressing Western forests, making them more vulnerable to fires. Communities nestled next to wilderness are used to girding for fire season, which typically occurs in the summer. Compared with decades past, however, the traditional fire season now lasts two months longer and first responders sometimes find themselves beating back flames in the winter. Rising temperatures all over the West, for one, have created dangerous, dry conditions. Over the past 35 years, Arizona has seen dramatic warming, with the state’s 10-year average temperature jumping from 15 degrees Celsius in 1977 to 16.3 C degrees last year. Experts say every little spike in temperature makes a big difference. Even a degree or so warmer, day in day out, evaporates water faster and that desiccates the system more. In Arizona, where a drought has persisted for nearly two decades, the manzanita, evergreen, mount mahogany and oak in the Yarnell area were so crispy Sunday that a nearby state fire-monitoring station recorded a near-maximum level of potential fuel in area vegetation. In many places, decades of aggressively snuffing out wildfires also have led to a buildup of fuel ready to ignite. On top of that, more people are living in fire-prone areas near forests, grasslands and shrub lands, which complicates firefighting logistics. Over the past years, firefighters on the front lines have complained about how flames “go berserk in ways they never used to see,” Running said. Though the Yarnell Hill Fire, at 13 square miles, was not considered huge compared with previous fires in Arizona, its ferociousness caught many off guard. Investigators said it appeared the Granite Mountain Hotshots were overrun by flames fanned by erratic winds. At one point, the fire raced four miles in just 20 minutes, fed by the dry brush and 41 mph winds that suddenly switched direction, said Yavapai County Sheriff’s Captain Jeff Newnum. Climate scientist Jonathan Overpeck of the University of Arizona said unless greenhouse gas emissions are curbed, huge, fierce wildfires will become the norm. “We owe it to the men and women who put themselves in harm’s way to do everything we can to make their firefighting jobs safer,” Overpeck said in an email. Governments also need to rethink the way they deal with fires, which could mean just letting some burn rather than sending fire crews into increasingly intense and unpredictable situations, said University of Montana fire scientist and elite firefighter Carl Seielstad. As residents across the West learn to cope, scientists point to the Nobel Prize-winning Intergovernmental Panel on Climate Change, which in 2007 predicted that warmer summer temperatures were expected to increase fire risk. Email “Hotter planet will increase risk of wildfires”. Feedback on “Hotter planet will increase risk of wildfires”.